PLEASE NOTE: This is the entire unedited article I wrote for the May 2018 issue of Montana Magazine about branding season on Montana’s ranches. It included many of my photos of cowboys and photos of cowgirls, too. I will continue to share my published articles here on my blog. Here is the text (and photos) from that article below. Branding season in the spring is an important time of the year for Montana’s ranchers; not only because it is an important tool to help inventory and track their herd, but it is also opportunity to network and renew fellowship with friends and neighbors. If you have never attended a branding you owe it to yourself to do so. Branding, after all, is quintessential Montana. And it is a living, breathing touchstone to our state’s past. Much to the surprise of many city folk, branding is required by law in the west. Years ago, before Montana became a state and long before its frontier was tamed, there were no barbed wire fences dividing the prairie land from Jordan to Miles City. Or from Havre to Winifred. Or from Clyde Park to Emigrant. Even today much of Montana’s prairie is considered "open range." Cattle wander far and wide as they feed on grass. Branding season each spring allows ranchers to separate each other's stock and brand that year's annual crop of calves. Another reason ranchers brand their cattle is to help prevent the theft of their animals. Some might thing wrangling is something from the past, but it still happens all too frequently today. Ear tags and electronic radio frequency identification (RFID) can be easily cut and removed from cattle. Branding is the only permanent way to tag an animal to help prevent it from being stolen. Branding, however, is much more than a tool for ranchers to use. Branding is also a tradition and right of passage of sorts for many Montanans. It is a community affair. After the long hard winter, family, friends, and neighbors, often separated by many dozens of miles, come together to help one another on branding day. And although it is not necessarily easy work, branding is something most men, women, and children look forward to in Montana’s cattle country each spring. The moment the morning sun crests the horizon, cowboys and cowgirls saddle up and work together gathering cattle scattered over many acres of Montana’s grasslands. Some ranchers, yes, use all-terrain vehicles (ATVs)—otherwise known as Japanese quarter horses in these parts—but most still prefer using a horse to round up their herds. Every crevice and coulee are searched, high and low, for cows and their calves. Soon all the animals coalesce and skirt over the land in one large pod; moving like a flock of starlings in slow motion across the rural landscape. It is a magnificent sight to behold. Most of Montana’s cattle are pasture raised. By far. In fact, over 80% of the food in their lifetime comes from eating the native grasses that have grown on Montana’s plains for centuries. The ranchers use grazing practices to prevent overuse of the land—which might damage the grasses their cattle consume. Very little else can grow where in many places the annual rainfall is only one inch more than what is classified as a desert. So, raising cattle on these Montana plains is really is the best use of the land. Once the herd is gathered in the corral, sorting and counting begins quickly. This will be the only time these animals are huddled together this closely. They are usually scattered all over the wide-open plains. In less than 30 to 45 minutes the cows will be sorted, separated, and released so they can go back to spending their days outside eating grass, playing, and exploring the open range. Only their calves remain in the corral. Finally, it is time for a break. Everyone looks forward to the food on branding day. Some ranches do a better job than others, but for the most part, the food they feed their helpers is very good. And after the herd is rounded-up, but before branding begins, everyone takes break and has a quick snack. No one will eat a full meal until all the animals have been branded and horses are put away. On the Mitchell Ranch near Cleveland, Montana Doug Mitchell's cinnamon buns are legendary, and they are probably a big reason why the Mitchells have more helpers on branding day than most. After their brief break, roping begins. Calves are plucked from the corral one-by-one to be branded. 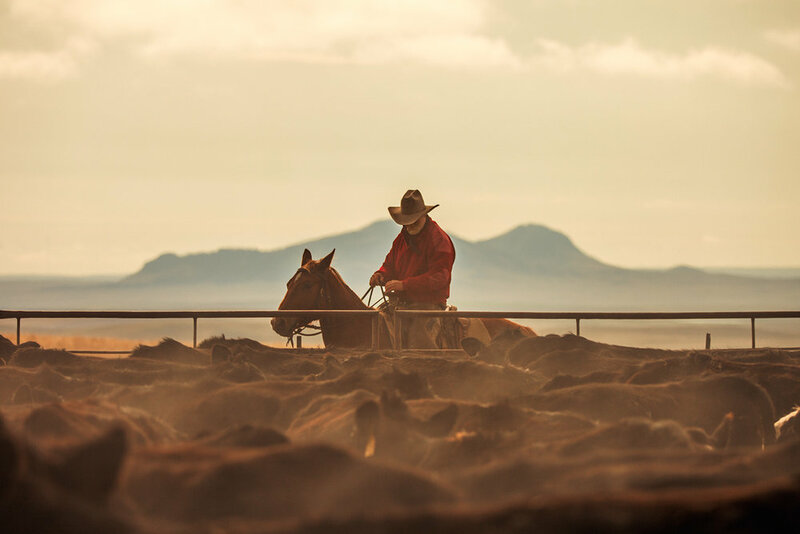 Many of these ranchers still use the same ranching methods handed down from generation to generation. The quality and care of their herd is very important to them. They spend their lives raising and respecting their livestock and giving them the best life possible. Many who have never met a real Montana cowboy probably picture a person who is big and brash. And though all but a few are strong to be sure, the truth is they are also modest and reserved. And they are very caring when it comes to tending to their animals. After all, the beef they produce for you to eat is the same they beef they feed their families. So, caring for their livestock is important to them. Children are also commonplace on branding day. Most ride horses with their parents in the saddle when rounding up cattle. Later they will command a horse on their own for the first time (with some guidance, of course) around the age of four or five. And before they are seven or eight they will rope cattle on their own. With few exceptions, these kids are perfectly happy working side-by-side with their parents on the ranch and seldom complain about not having the latest electronic gizmo or video game. No, these kids would much rather receive a new saddle or pair of leather chaps for Christmas. Just ask them. It only takes a few seconds to brand a calf. They are then counted. And then they are then released so they can be reunited with their mother, who is often baying nearby. Despite these herds having hundreds and hundreds of animals (all of whom look nearly identical), it is amazing to see every calf standing alongside its mother at the end of the day. When the day’s work is finally done, and the fires are turned off, and after the horses are fed and put away, everyone gathers inside the warmth of the rancher’s house to share a hearty meal that is richly deserved. And often it is a meal that would rival any served on Easter or Thanksgiving Day. Young and old, everyone sits around the table; laughing and telling stories. Some will share a sip of whiskey, others will share a glass of milk. But all of them share a common sense of accomplishment and community often missing in many other homes these days. It is pure Montana.